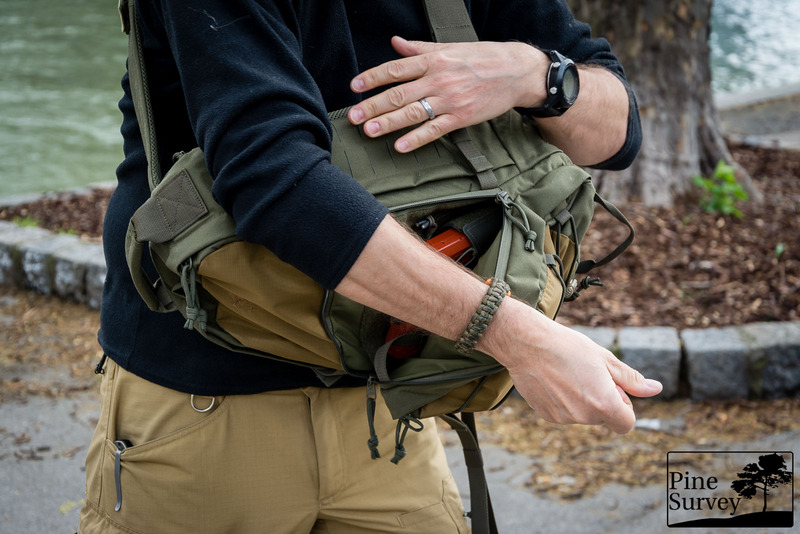 The TT Tac Sling Pack 12 is Tasmanian Tigers first approach to a slingbag and offers a concept which is usable for both left and right handed users. 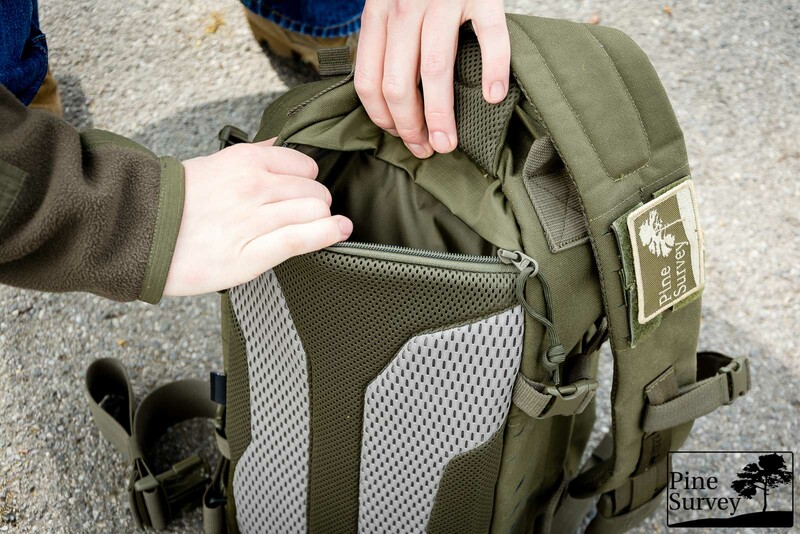 The build up of the pack features a large main compartment with a large mesh pouch, a detachable laser cut MOLLE panel and a velcro back on the inside, as well as a smaller pouch attached to the front, with a dedicated admin panel. 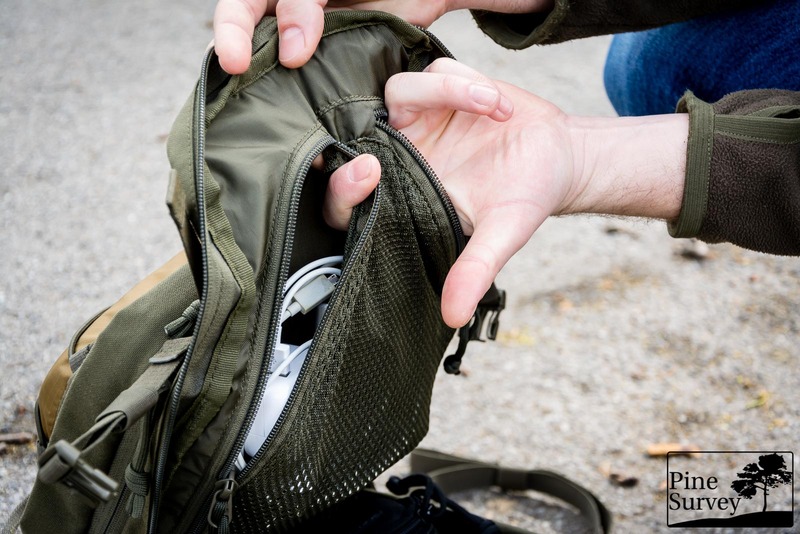 Between these two compartments you will find a hidden and velcro lined CCW compartment, which can be opened up from both sides by a dedicated strap. 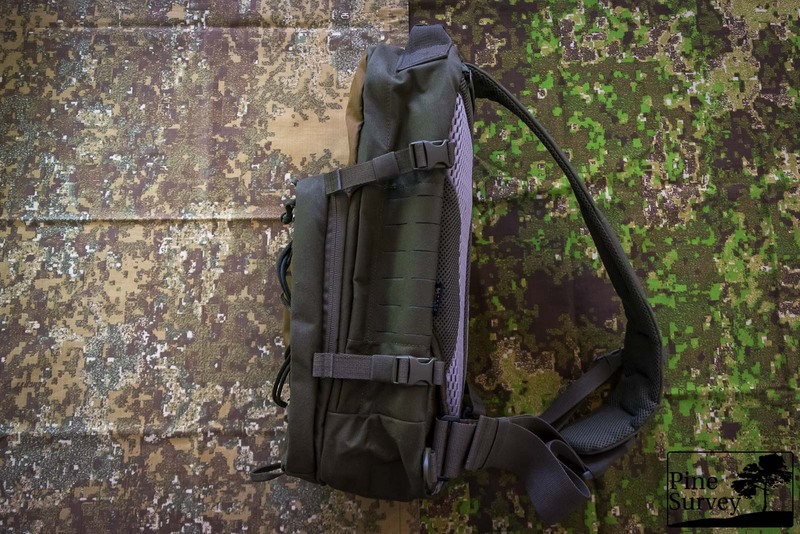 The Tac Sling Pack 12 has a padded back with an additional small pocket. The sling itself is long enough to accommodate tall persons as well as smaller ones. 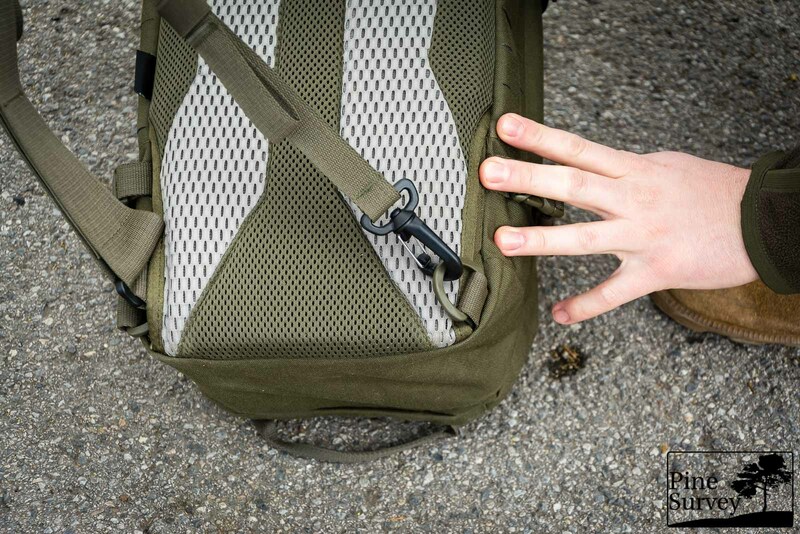 To give the user fast access to the slingbag, there is a webbing handle mounted at the bottom of the bag to enable the person wearing the slingbag to quickly bring it to the front. 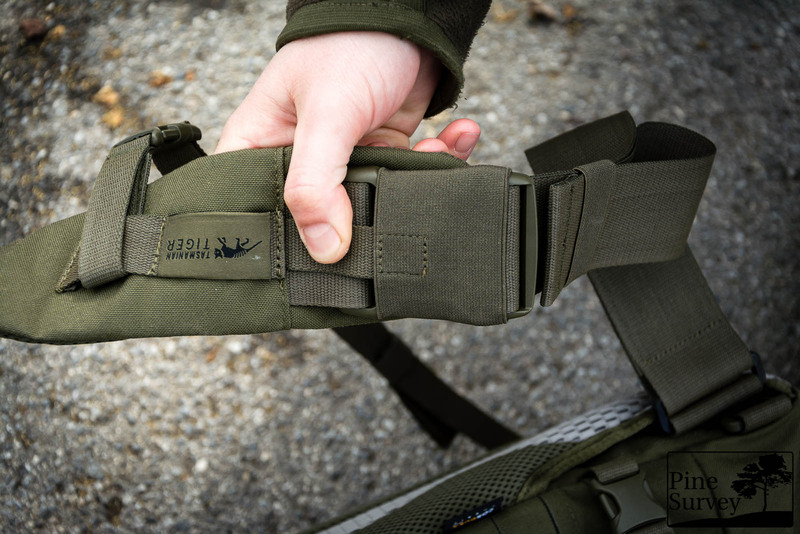 The general set-up of the Tac Sling Pack 12 is tall and slim in order to hold it in place close to the body. 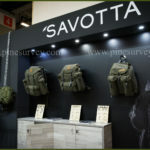 The look itself is quite slick and the design is aimed at giving the pack a less military looking profile. 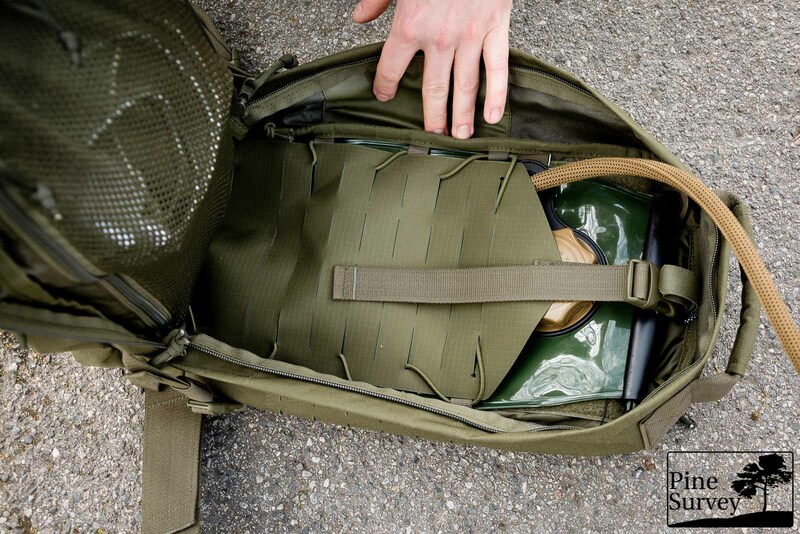 At the same time there is the option to attach MOLLE accessories to enhance the user’s options. 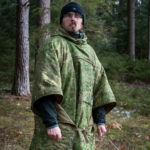 In order to do this you will find 2 channels with 5 rows of MOLLE on the two sides of the bag as well as 2 channels with 3 rows on the shoulder strap. Four compression straps provide the possibility to tighten down the Slingbag and bring it closer to the body. Other features on the outside are a dedicated handle on top of the bag as well as another handle at the bottom, which can be used to quickly draw the slingbag to the front. There is also the option to lace shock-cord through several loops in order to hold items like jackets, blankets in place – but this is solely optional since no shock-cord is supplied with the bag. On the backside you will find a small zippered slip pocket for thinner items, like IDs, or documents which you want close to your body and the least accessible by outsiders. The main compartment features a large mesh pocket to the front which is accessible from both the left and the right side via zippers and which spans over the whole front area of the interiour. On the backside of the compartment you will find a large area of velcro, which gives you the option to mount various accessory pouches and loops on the inside. Attached via shock-cord, which is laced through several loops, is a large laser-cut MOLLE panel. 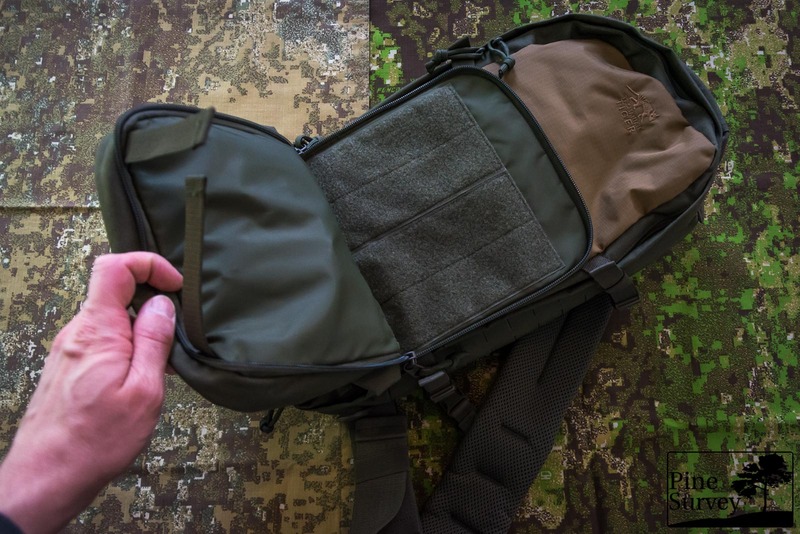 This features 4 channels and 7 rows of MOLLE and can be obviously used as another option to mount pouches etc., but it also works as a divider or slot for your water bladder. 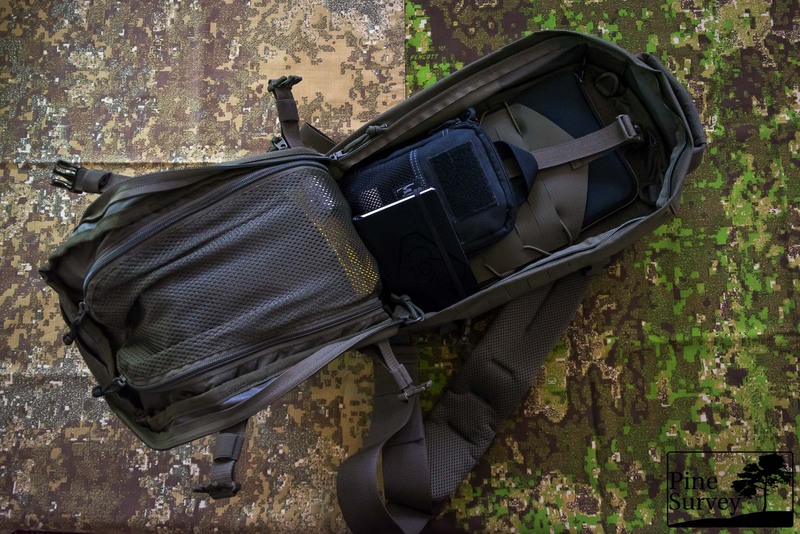 Speaking of the latter, there are various mounting options inside of the TT Tac Sling Pack. 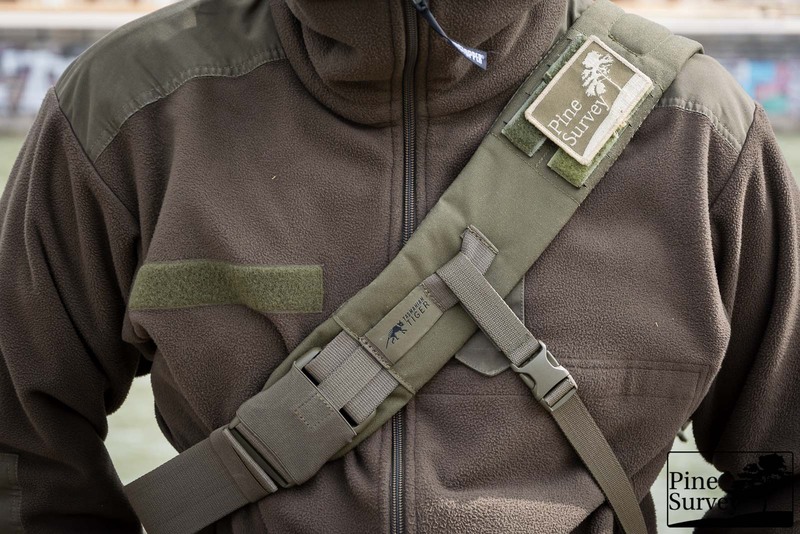 You can find a standard velcro flap, a small cord loop and a buckle which holds the MOLLE panel in place. As with other packs of Tasmanian Tiger, the buckle is attached underneath the velcro flap. 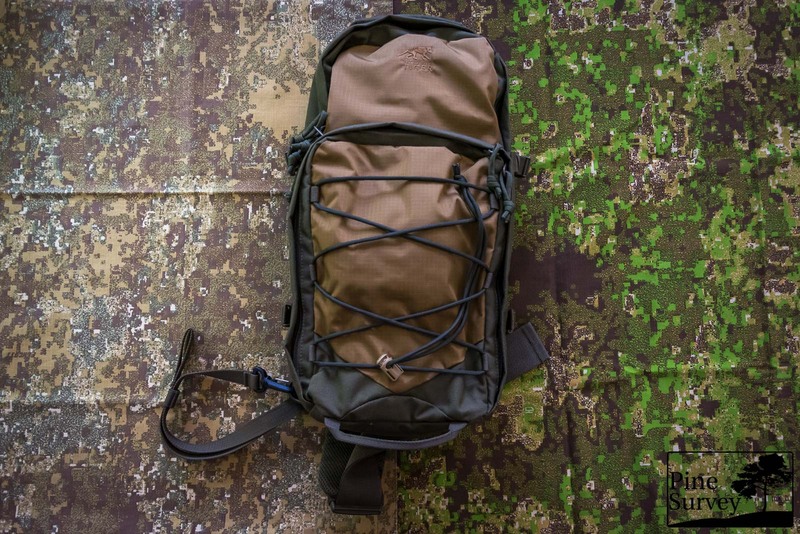 This is a major design flaw in my opinion since it is in the way if you want to secure your water bladder AND your MOLLE panel. Of course you will also find a hypalon reinforced opening for the drinking tube. On the upper left and right corner of the backside of the main compartment you will also find one D-Ring each to secure further gear with a lanyard and the like. The CCW compartment is located in between the large body of the slingback and the pouch (or admin compartment) attached at the front. The zipper goes almost all around the pouch which gives you wide access to a slot-like compartment, which is lined with velcro. There is one strap attached to the upper interiour on both the left and right side. Depending on which side you carry the pack, you can leave one of these straps hanging out between the two zipper glides. 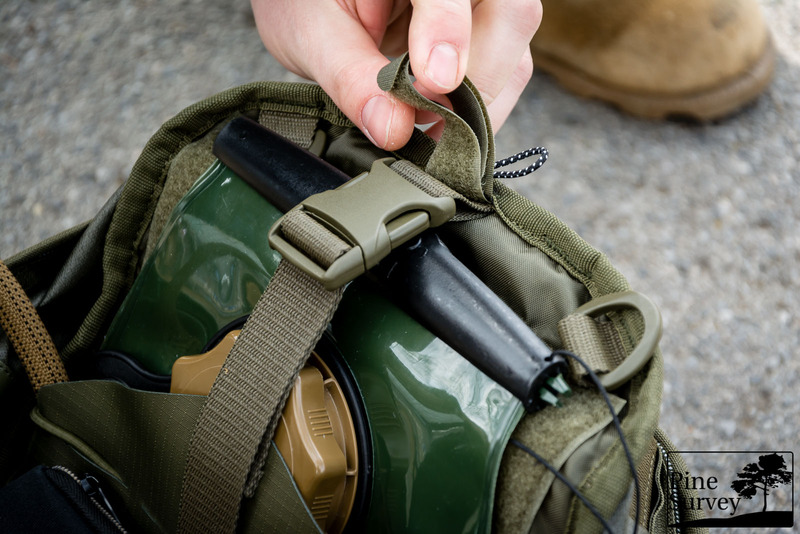 To quick-draw your weapon, you only have to pull the slingbag forward with the help of the dragging handle, grab the strap and with it open the compartment to get access to your weapon. This works best if you leave the strap out at the corners, because otherwise the rectangular shape of the pouch will hinder you from opening the zipper – having a more rounded pouch would be an advantage here. The second compartment, or better said, the front pouch features several options to organise your smaller items. To the frontside you will find a zippered mesh pocket, which gives enough room for bandages, or tourniquets and other items that size, which you want to be able to identify through the mesh. The admin section on the backside of the compartment is similar to that of the TT Admin pouch, but with some additions. Below the admin section you will find another mesh pocket which is open and keeps closed by an elastic tape. 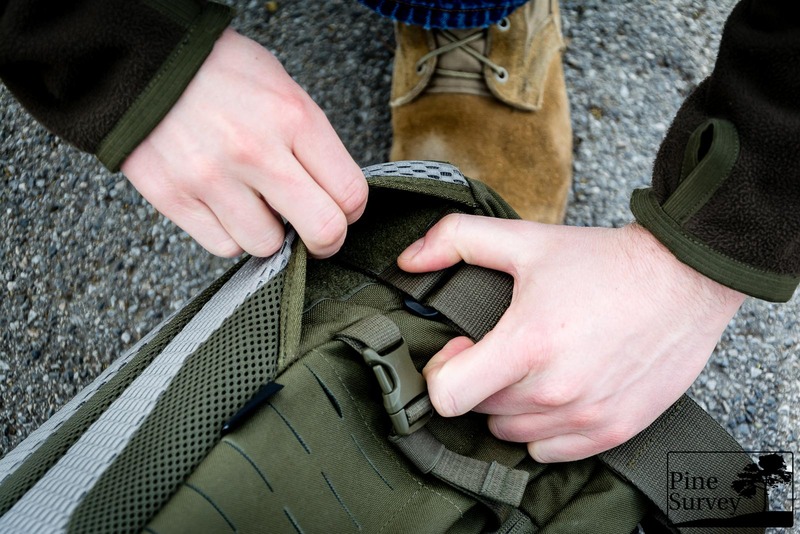 Right next to it is a D-ring, which is smartly positioned there, because it will be directly in front of you if you bring the Sling Pack to your chest (as a right handed person) and open the compartment. On the left side of the admin section you will find two elastic loops for pens, chemlights, glass breakers etc. The admin section itself is composed of a large slip pocket on the back (closed by a small velcro tab), and mounted on it, two smaller slip pockets (also closed by a velcro tab). These two smaller slip pockets have elastic webbing sewn on them, which feature even more slip pockets for SD-cards and the like. The opening of these pockets is helped by webbing flaps which you can also use to keep pens. Even though the thought behind these pockets is nice, there are some downsides to them, but I will get to this later. Behind the admin section there is also a zippered slip pocket for thinner items. 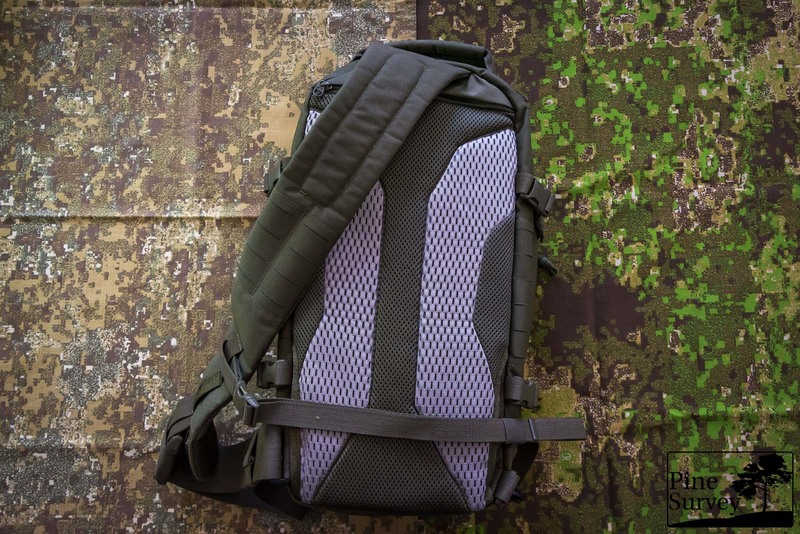 The TT Tac Sling Pack 12 features some light padding on the back, but it is not as thick as with the TT Tac Pack 22. Nevertheless you will find the same geometric shapes for your shoulders. The grey mesh is a larger mesh than the green mesh, therefore more ventilation is provided at certain areas of the back. The shoulder strap is nice and wide, perfect for an effective load distribution. With this, the padding is equally light. 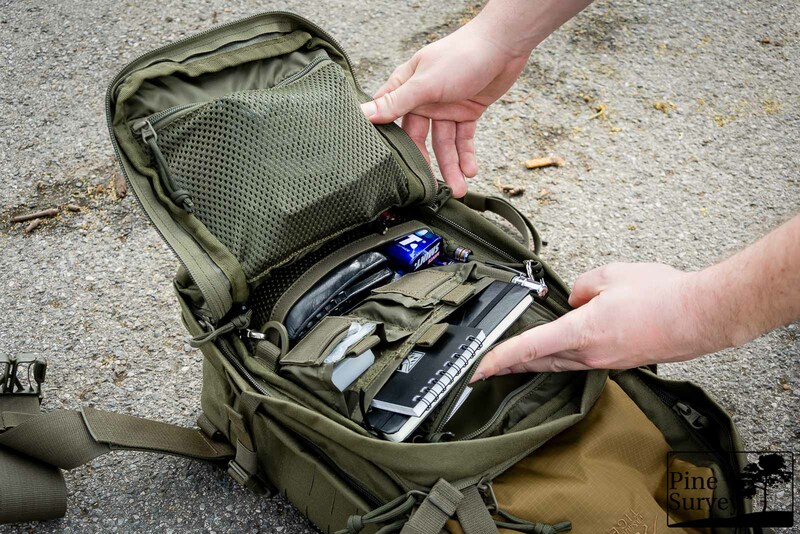 As with most features on the Tac Sling Pack 12, the carry options are both sided as well. Depending on which side you want to carry the slingbag, you can detach the lower end of the shoulder strap and change sides. The velcro attachment is very effective and there is no need to worry it could come loose. For quick detachment there is a big buckle on the shoulder strap. This can be nicely hidden in an elastic band that can be slided over the buckle. This will achieve noise reduction as well as an involuntary opening of the buckle. To provide more stability, there is a strap which can be attached to the shoulder strap. The attachment on the strap is with a buckle, that is easily attached via webbing. To the Slingpack the strap can be secured with a carbine. By now this subheader could theoretically become obsolete when it comes to Tasmanian Tiger. I could not find anything worth complaining in regards to workmanship or quality control. Tasmanian Tiger is running a tight ship here and the Tac Sling Pack 12 has no deficiencies in that regard. Everything is clean, the seams are straight, no shortcuts were taken. It is worth noting though that Tasmanian Tiger upgraded to YKK zippers. In comparison to the old ones these run just as smooth, but some people do consider this an important factor. While using the pack I found several aspects which were not to my personal liking. First of all the admin panel and its various pockets are too small for my taste and the items I am carrying with me. They are perfectly suited for additional batteries/akkus for your camera, SD-cards and various other small object, but as soon as you want to carry larger essentials, like lighters, multi tools, chemlights, or little tins with mints (to be really trivial) you reach your limits quite fast. At the same time the velcro closures are too small to get a good grip when closing the pockets. In that regard TT could just go with a large velcro area like in the CCW compartment and offer various optional admin panels or just loops, in order to give the user the option to really customize the pouch for his/her personal needs. Having the velcro interior of the TT Modular 30 pack in mind, TT could even go as far as offering a MOLLE laser cut velcro lining in here. Another point would be the compression straps on the sides. In the current configuration the buckles are located on the backside, close to the padding. Changing sides, would give the user the possibility to simultaneously open the buckles when opening the zipper. Coming to the CCW compartment: While being nicely hidden and able to be opened ambidextrous, the compartment is only usable as long as the front pouch with the admin panel is not fully loaded. Because of the slim profile of the compartment the gun uses up lots of room. Of course this differs from gun to gun and if you choose to put a fullsize, compact or subcompact in there! Last but not least: TT gives the user the option to lace shock cord on the front of the smaller pouch. The loops are there, but not the shock cord. This is a minor aspect, to be honest, since most users have the additional cord at home, but it would be a good idea to at least incorporate a small amount of cord with the Tac Sling Pack 12. 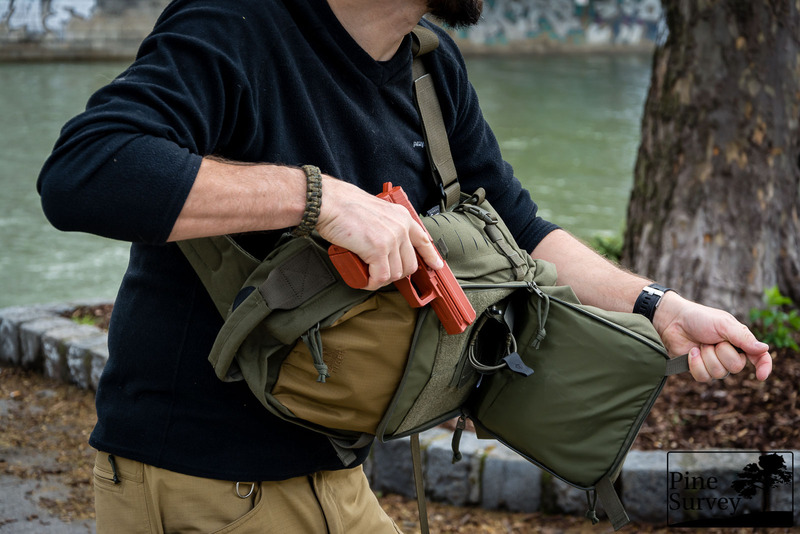 The TT Tac Sling Pack 12 is worth considering if you are looking for a small volume slingbag which is low profile and streamlined at the same time. Given its slick look and the option to carry it on either your left or right shoulder, as well as the complete ambidextrous design, which gives you the same kind of access from both sides, it is a remarkable bag/pack to look at. It has some aspects which I personally would like to see being changed, but when it comes to these, opinions are always different from user to user. 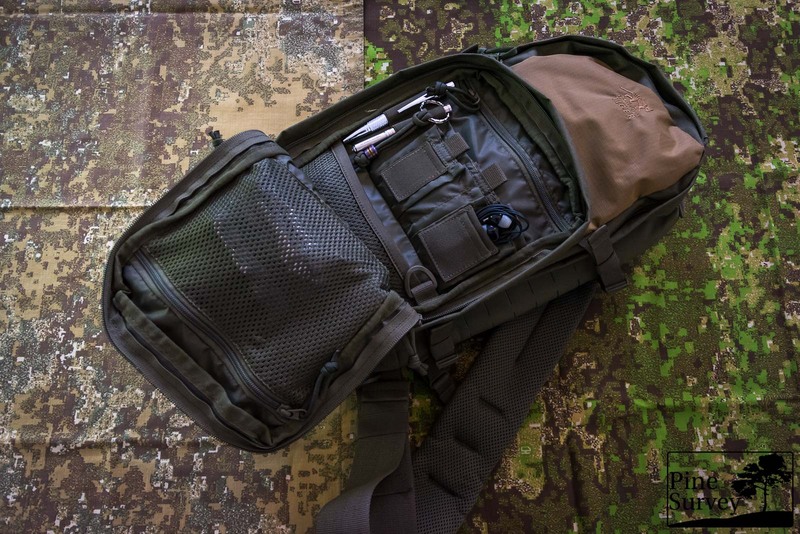 Given the fact that professional users in my circles are quite fond of it, I would say that the TT Tac Sling Pack 12 is an option worth looking at. In that regard it is safe to say that Tasmanian Tigers first attempt for a slingbag was successful and I do hope there will be further generations of this pack. With that being said I want to thank you for taking the time to read – I do hope the review was of use for you. Lots of thanks also go out to Tasmanian Tiger for giving me the chance to take a look at this item, but also to my friends who helped me throughout the process! Take care – until next time!